Combine teriyaki marinade, honey, garlic and ginger in a small saucepan to heat through. Remove from heat to cool. Season with sea salt and black pepper. 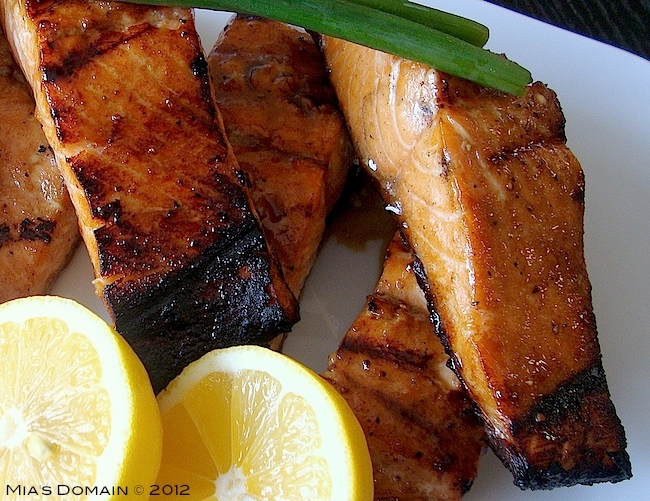 Cut salmon into 6 pieces and marinade for two hours or more in a airtight container in the refrigerator. Remove from refrigerator and bring to room temperature before cooking. Arrange salmon on the hot grill and cook for two minutes, turn over for a further 2 minutes on the other side basting with the marinade frequently. Remove from the grill and drizzle with extra virgin olive oil and fresh herbs of your choice to serve. This is the right way to cook salmon. I have seen few recipes recently, simply over cooked. Another recipe I saw online was baking salmon fillets for 1 hr. nothing worse than having some dry salmon for dinner. This is great Mia. Angela.